Length: 26 in. Pit to Pit: 22 in. Heavyweight black leather with fringe trim front and back. Length 23". Chest 19" across under the arms. Snap close front. 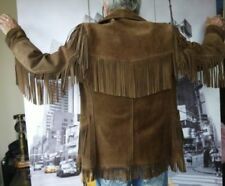 Vtg 1970s Fringe Cowhide Biker Leather Jacket Men’s 40 Medium. Condition is Pre-owned. Some wear to the end of the sleeves but this thing is awesome lotta patina all zippers function properly, looks pretty tough no tag but I’d say if it’s like a 40 measures 22 inches armpit to armpit and 25 inches in length. Shipped with USPS Priority Mail. JORDAN CRAIG LEGACY Ed. DENIM JACKET Ice Bl. Levi's Trucker Vest Denim Fringe Blue Mens Size M New no tags. Shipped with USPS Priority Mail. IT IS MORE OF A BLAZER WITH TWO LEATHER BUTTONS. IT IS SHOWING MINIMAL WEAR THERE IS A HOLE IN THE SEAM OF THE LINING AROUND THE FIRST BUTTON SEE PIC 10, 11. (what would life be without a pet!). This Scully Leather shirt is perfect for authentic frontier wear. A premium Scully leather shirt that's supple & light enough to wear comfortably. 100% boar suede leather. Satin lined upper body for comfort wear. 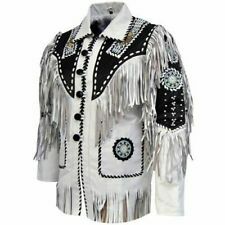 White Reed Sportswear Jacket | Hip Vintage Western Fringe Jacket. Condition is Pre-owned. This gem is a made of leather, size Large. It’s perfect for a rockstar outing... so many styling possibilities! Sleeve length: 26", Length: 45 1/2", Pit: 22". Size 38R, with belt. Barely worn. Is alittle wrinkled from storage. Otherwise in great condition as seen in pictures. Orange County Choppers Motorcycle Vest Denim Bikers Jean Jacket Size XL is in very good Condition, no rips or stains. Shipped with USPS Priority Mail. Free shipping!! 3B West Trapper Shirt. Fringe Trim. Eagle Beaded Accent on Sides. Black Suede Leather. Lace Up Front. Satin L ined. 100% Leather. Sleeve Length 26". Mens Large Womens Brown Genuine Leather Tie Front Brown Vest Purple Lining. Mens Large or woman’s - Brown Genuine Leather UNIQUE Tie Front Vest w/ Purple Lining.. great front w/ brass and leather closures. Condition is Pre-owned in perfect condition. 2 Lg. Pockets . Don’t believe it’s even been worn. Estate sale . Shipped with USPS Priority Mail. Has places where it light and darker per normal with suede. Hooded poncho with fringed trims. 100% GENUINE & AUTHENTIC ZARA ITEM. NEW COLLECTION 2018. TOP OF NECK TO BOTTOM OF JACKET 29". Mens Scully Leather, Fringe Jacket, Mens Leather Coat, Mens L Jacket. Size 40. Condition is Pre-owned. Shipped with USPS Priority Mail. 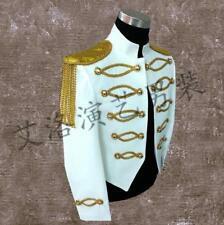 The Jacket has one missing scallop on right pocket and a loose scallop on left pocket. Everything else is in good condition. Lining has no rips. One small stain on right front. It has a little snag here or there on lining. This Scully fits a Large body mans frame. It is in great shape and still looks very good. Thanks. black leather motorcycle jacket with fringes good condition. Condition is Pre-owned. Shipped with USPS Priority Mail. 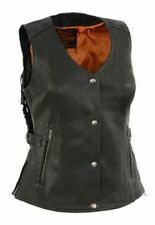 WOMENS HUDSON LEATHER BLACK MOTORCYCLE JACKET W/ FRINGE & ZIP OUT LINING SIZE 46. Zara Leather Fringe Jacket in Large. featured in a beautiful dark brown color. Fits like a. This jacket is a show-stopper really soft suede leather featuring a zip front ,2 front pockets and 1 interior pocket. This coat is in overall excellent condition but is a bit dusty in a few areas so it could use a dry cleaning. The detail on this coat is absolutely great though! This is definitely a high quality super nice coat and it is thicker so perfect for the winter! All the buttons are the same and it is a beautiful design. Please refer to all pictures. All my items come from a smoke free environment. 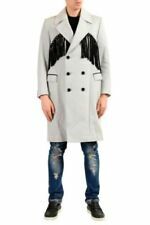 When buttoned coat measures 27” across the front and 27.5 from top to bottom. Thank you so much for looking! Scully leather wear is handcrafted from grade "A" leathers, with special consideration given to surface character and softness of hand. Scully is leather wear you can be proud to own! This rugged west inspired Scully suede leather coat is loaded with long leather fringe on front and back yokes, shoulders, sleeves, and front pockets. 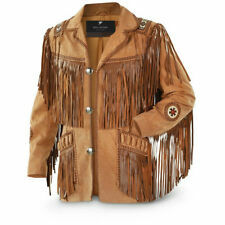 Guenuine Leather Fringe Mens Jacket. Shipped with USPS Priority Mail. Jacket in fair condition. Shows some signs of wear but nothing major. Has some scuffing on cuffs and back. Please see pictures for details. Pit to pit: 22" Length: 24"
Top of shoulder to the top of fringe 25". Fringe Length 5". This coat could use a good professional cleaning. It is missing buttons. Brown suede shirt jacket with side zip and fringe.